When making a decision about which diesel fuel is best for your engines, consider the many fuel characteristics that can affect the way your engines perform. One characteristic that is commonly overlooked is cetane. In the U.S., the minimum cetane number is 40, which is low compared to many other countries. Many OEM’s prefer that diesel fuels with higher levels of cetane are used in their engines for optimum performance. In gasoline, the octane rating measures how susceptible a fuel is to detonation, which can cause engine knocking. Detonation occurs when the gasoline combusts from the heat and pressure in the engine instead of from the spark plug. The higher the octane rating, the more difficult the fuel is to combust, which prevents detonation. A diesel fuel’s cetane number is essentially the opposite. 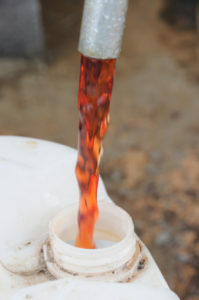 A diesel fuel with a high cetane number combusts more easily than a fuel with a low cetane number. Unlike gasoline, this is a good thing. This allows for a shorter ignition delay, which causes the fuel to combust closer to the ideal timing right before the piston reaches Top Dead Center (TDC). This results in a diesel fuel that burns more quickly and completely, and provides a number of benefits. The most noticeable benefit is improved drivability. Use of a higher cetane fuel can reduce drivability issues such as engine knocking and misfiring from poorly timed combustion, and reduce overall engine noise. In a diesel engine, fuel is combusted by pressure or autoignition. As a result, diesel engines can be harder to cold start. Higher cetane fuel can help reduce any cold start-up issues that you may be experiencing due to easier combustion. Higher cetane fuels produce lower peak pressures in the engine. This reduces stress on the engine and can help prolong engine life. In addition, higher cetane can improve emissions and fuel economy. When fuel combustion is incomplete or timed improperly, not all of the fuel completely burns off. This is most common during cold engine starts. When fuel is not completely burned, not all the energy is converted to power from the engine, thus reducing fuel economy. Incomplete combustion can result in more harmful emissions byproducts such as particulate matter and unburned hydrocarbons seen as white smoke. Use of a high cetane fuel can prevent these issues and keep an engine running at optimal performance. Be sure to look for fuels that have a cetane number higher than 40 to ensure you are getting the best performance from your fuel. If a high cetane fuel is not available, there are many bottled additives that contain cetane improver chemistries that can give you the performance boost you need.